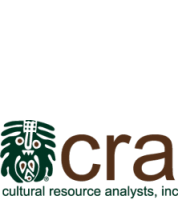 Sayre School Education Program | Cultural Resource Analysts, Inc.
Beginning in 1997, CRA worked with 4th graders from Sayre School on the Sayre School Historical Archaeology Project at Waterwild Farm in Lexington, Kentucky. The project was designed to investigate the spatial layout of the historical farm, as well as the age of the farmstead and associated structures. Waterwild Hall was built sometime in the 1830s and is a brick, Federal style I-house with an L-addition on the rear. Evidence suggests that an earlier residence was located on the site, or that materials from an earlier structure located elsewhere were used for constructing Waterwild Hall. At the time of the investigation there was little known about the earliest owners of the property. In the 1880s the house and 3,000 acres were acquired by Alexander Carrick of Georgetown (great-great grandfather of the current owner). He named the house Waterwild Hall. At the time, the farm was bounded by Russell Cave Pike to the east, Carrick Pike to the north, and Mr. Horeb Pike to the west. Upon Alexander Carrick’s death, the farm was divided among his three sons Thomas, Oscar, and Dr. Robert Lee Carrick. Dr. R.L. Carrick inherited the smallest portion of the farm but retained the ownership of the house. Waterwild Hall, at the time of the project, was owned by James K. Millard, father of Caroline Carrick Millard who attended Mrs. Janie Cowgill’s Fourth Grade class at Sayre. Mr. Mallard and his wife, Madelyn, started renovations in 1992, beginning with the rear portion of the house, retaining or replicating as much of the original style and materials as possible. CRA developed a proposal for the archaeological investigations that allowed the Sayre students to gain hands-on experience, while answering the research questions developed in the proposal. The project was divided into six parts: Yard testing, artifact washing and identification, student analysis, group discussion of findings, future research, and reporting and curation. From 1997 to 2002, CRA involved Sayre students with the archaeological investigations at Waterwild Hall. Each school year CRA personnel collaborated with teachers and students at Sayre to conduct the archaeological fieldwork and answer the research questions developed. Over the next few days, the CRA blog will discuss each year of the education outreach program, be sure to check back daily.